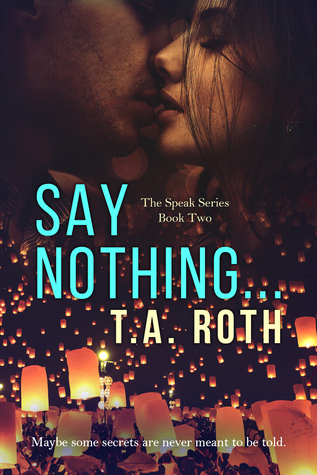 Say Nothing is not a stand-alone novel, Say Something (book 1) needs to be read first. I wanted to love Say Nothing, I really did. I hoped it would hold that illusive ‘something’ that seemed to missing from Say Something. I hope that it would pull me and a hold on for dear life. At times it came SO close. So close. There were moments that were amazing. Moments when I thought, ‘Yes! This is happening, it’s going to cross that threshold into greatness’. Then the characters, the plot line, the writing would shut down. It broke my heart. I felt like the author was afraid of crossing that line, that frightening line where you inflict deep suffering on your characters, the line into darkness. This book needed to take that plunge. Yes, there were shadowy corners and places where evil started to seep in, but it needed more. TA Roth continually flirted with that line and I was eagerly anticipating her crossing it, but it never happened. The bones of this story, both book 1 & 2, were great. The overall plot points were solid. The characters were well developed, including the supporting characters. I feel like this could have been one of my top reads for the year, had the darkness been embraced in its entirety. As it stands it fell a little flat for me. For someone who only wants to flirt with the true tragedy that life can inflict on a person, this book would likely be perfect. There was just enough pain inflicted on the characters to hurt them, but not quite enough to break them to pieces. My soul craves the deep and unforgiving pain of ruination, so the lack of that type of darkness, when it was set up so well, made the book fall a little flat for me. Sounds really good. Enjoyed the review. Looking forward in reading this!